What Steve Jobs understood, that many others do not, is that it takes much more effort to achieve simplicity than it does to achieve complexity. Everything naturally expands towards the complex, unless very tightly driven the other way, and cultures are no different. Almost every client we work with suffers from patterns of behavior in their culture that are associated with lack of prioritization. We hear from executive teams wanting to simplify their business to give it more focus, from employees voicing complaints about a lack of work/life balance, and about a general tendency to pile on new projects without reducing workload. Complexity creeps into our every attempt to get things done. And it costs us. Financially, through delays in implementing initiatives and inefficiency. And physically, by ratcheting up our stress levels. Clearly there’s a strong cultural trait here that most organizations would benefit from changing. And yet, we’ve found this to be amongst the most difficult patterns of behavior for leaders to change. 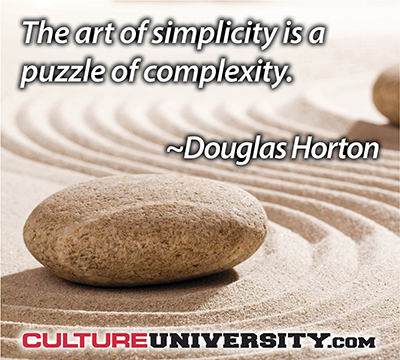 Simplicity as a value is a deeper concept than simplicity as a process. It’s an uncompromising desire to de-clutter everything. Your thoughts, your life, your communication, products and processes. And it really does need to be an obsession. At Walking the Talk we’ve observed that it’s almost impossible to change a pattern of behavior without understanding the underlying patterns of thinking that drive it. Yes, to HAVE a different outcome, you need to DO different things. But you also need to look at the layers that sit beneath what you’re doing—the feelings, beliefs and values that cause us to choose certain actions. This is called the BE-level. There are a number of different BE-level causes for complexity and a lack of prioritization. If you can become conscious your own drivers, then you’re in a strong position to make some changes. What if by choosing one path of action, you miss out on another opportunity? What if you say you can’t take on an additional workload and it’s given to someone else and turns out to be a very high-profile project? What if that meeting is the one where some major decision is made and you’re not a part of it? At Apple, small meetings were the cultural norm. If you weren’t critical to the agenda, you left. Apple got it; there just isn’t room in a culture of simplicity for FOMO. As the song goes: “anything you can do, I can do better.” Have you ever had the feeling that if someone else has contributed an idea, then should add one too? The little voice inside that mutters: “By shouldering more and more, I prove my worth. By adding clever refinements and complexity, I prove my prowess.” It’s time to silence that voice. One-upmanship is the enemy of simplicity. To choose by prioritizing means taking responsibility for a choice and its consequences, even if it might be the wrong one. Complexity hides accountability, and there is safety in numbers and covering all bases. For example, it’s often easier to say yes, than to have a straight conversation about work overload. People who liked working with Steve Jobs will tell you that he wasn’t being mean, he was just being simple. Blunt is simplicity, meandering is complexity. Being simple involves having many difficult conversations. An unwillingness to have these conversations is one of the reasons organizations can get so complex. Many of these muddled thoughts and feelings are only ever fleetingly examined. Why? Because ‘busyness’ makes it hard to actually stop and reflect. If you really want to change the patterns of behavior in your culture that prevent simplicity, then take a look at these three and consider which of them relates to you. Instead of trying to just change the behavior, couple it with a commitment to change your beliefs and feelings about fear of missing out, one-upmanship or avoidance. 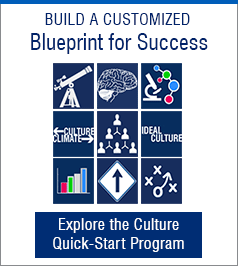 Culture is the patterns of behavior that are encouraged discouraged or tolerated by people and systems over time. As a leader, what complex behaviors are you encouraging, discouraging or tolerating? Every time you sit in a meeting and allow complexity to creep in and choose to say nothing, you are tacitly approving of a culture of complexity. My experience of culture transformation is that it comes from changing the daily habits of people’s behavior, and being relentless about it over time. What is the core thing we are trying to do? Am I adding complexity in order to show off my expertise? Try simplifying something at home: your wardrobe, a junk-filled cupboard, desk or garden shed. Whilst you’re doing this, watch your attachment being activated—that desire to hold on—and the accompanying justifications that are running through your head. Your tendency towards complexity at work is just another version of this response. If you can conquer these habits at home, you can do the same at work. And vice versa. Until simple becomes a way of being. I look forward to your success and thoughts for discussion.